History of Shandon Mound – R.A.C.K.S. There is very little recorded history of Shandon Park Mound. The mound is situated on a ridge overlooking the Lagan Valley and the Dundonald gap and possibly dates to the late C12th/Early C13th. Shandon means Old (elevated) mound, leaving the possibility that this Anglo-Norman motte, like many others, was built on a pre-Norman Fort site. The mound gave its name its name to Dundela in the 1306 Papal Taxation Rolls, where Knock Church was listed as the ‘chapel of Dundela’ and valued at 40 shillings. Indeed in 1847 the great scholar Rev Dr Reeves (1847) stated that the church was a short distance away from ‘a fine earthen fort from which it is likely that the parish took its name. Although we know believe that Shandon Park Mound is an Anglo-Norman motte, opinions on its purpose have varied over the last two centuries. As mentioned above, Reeves considering the monument was a fort and by the late C19th, it was described as a funerary mound (one historian went as far to say that he believed there was a (displaced) dolmen at the top of the mound). 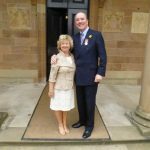 The site came into State Care in August 1937 and was Scheduled under the Historic Monuments and Archaeological Objects (NI) Order 1995 in 2006. 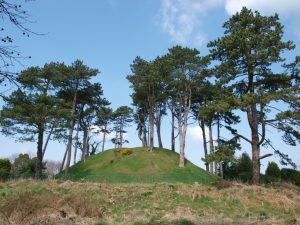 Shandon park Mound is the remains of an Anglo-Norman Motte, located 320 metres from the medieval church of Knock and likely would have been part of a manorial group. As it survives, the motte is approximately 10m high, with an oval summit measuring 22m x 13m. Motte and bailey castles were defensive earthworks introduced by the Normans after their invasion in the C12th. This type of fortification would have been relatively easy to build with unskilled labour and could be erected quickly, typically within just a few weeks. The Bayeux Tapestry features detailed scenes of motte construction. A motte would have served two functions; it could be used as a lookout given its height and it would also serve as the last stronghold in case of attack. Mottes were made out of earth and flattened on top. Some mottes were built over earlier structures such as Bronze Age barrows or Early Christian Raths. A wooden or stone keep would have been built at the summit of the motte, which combined with the very steeps sides of the mound and a palisade fence erected around the summit, would have given protection to the defenders as they rained down arrows on attackers. The Keep could have been several stories high. The lowest floor of the keep would have been used for services, storage and possibly kitchen facilities. Above this would have been a reception area or great hall. The upper storey would have been the Lord’s Private apartment. This design of keep was reflected in later castles and tower-houses in Northern Ireland. To date, there have been no archaeological excavations at Shandon Park Mound to confirm what, if any structures would have been at the summit of the Motte. Mottes normally ranged from 3-30m in height. Normally the lower height of mounds could be said to infer a non-military function on the motte- Shandon’s height of c.10m would be rather average in height and it would likely have been a defensive military structure. A deep ditch was normally dug round the bottom of the motte for added protection. The excavation of the ditch would have provided material for the construction of the motte itself. A possible ditch was noted around the motte in 1989. This possible ditch feature appeared to be approximately 15m wide and may indicate that Shandon Park Mound was built on a platform or it could be the remains of an earlier rath. Most mottes would also have a bailey built at the bottom of the motte and varied between 1-3 acres in area. Baileys were fortified enclosures and would have contained buildings such as stables, storehouses, bakeries and quarters for the followers of the lord of the castle. The bailey would also have been surrounded by a palisade. There is no evidence of a bailey at Shandon around the mound but they may have been obscured by surrounding houses and gardens. C17th- church is listed as Knock-Collum-Kill (St Columba’s Hill). In 1622 the church was transformed for Anglican worship and the Medieval church was abandoned in 1637 in favour of a new church known as Knockbreda, in neighbouring townland of Breda. The new townland of Knockbreda was formed in 1657 when the Knock-collum-Kill, Kirkdonnell and Breda were combined. The exact boundary of the previous parishes has now been forgotten. Rev Dr Reeves (1847) listed the church as among churches founded by Columba or with strong Columba connections but there is no evidence of a pre-Norman Church here. A well was located to the south of the ancient graveyard (now within the grounds of the Golf Club) and was described has having stone steps down to the water’s edge. It was filled in in the 1920s without destroying it, preserving it in situ. The church was located on a prominent hilltop with views over Belfast and originally measured 13.5m x 5.6m. The church was in a ruinous condition by the C19th. The W gable wall fell in 1869 and the E gable wall fell in 1872. The site of the church is now overgrown with no surviving signs of the ruins.